Hi! 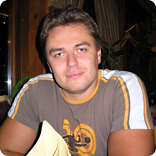 I am Andrey and I've been a freelance designer and programmer since 2000. Please check my portfolio to see my best works. I'm self employed working for web agencies and direct customers so if you need help for your website or if you're looking for a programmer let me help you and feel free to contact me.